Unlock D2K and DK Foundry on your ArcadeSD board for one price. 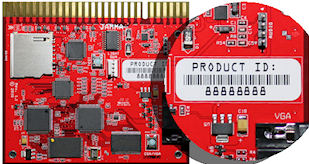 Each ArcadeSD board is has a unique Product ID. You must enter your ID below when you place your order. One purchase unlocks one board. You must complete a separate purchase for each board you wish to unlock. When using the ArcadeSD application to add the games, you MUST upgrade the firmware on the first screen, even though the application says you've already got the most current version (1.6.0). You have to have Donkey Kong installed for DK Foundry and D2K to work, otherwise your arcade machine will report a bad ROM issue when you try to select either game from the menu. You will receive an email when your Product ID has been registered. Registration can take up to 7 days.